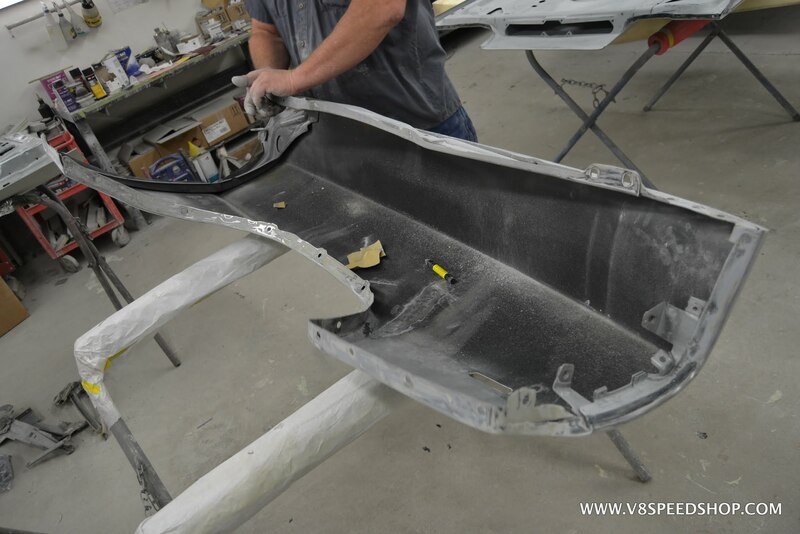 Once the filler hardens, the shape is roughed in with a file board sander. Most of the work is done by hand, with long and short blocks, straight and curved. The first layer of filler is sanded to 80 grit. Then the entire car is sanded again to 180 grit. Any sand-throughs or tricky spots are treated to another application of filler. 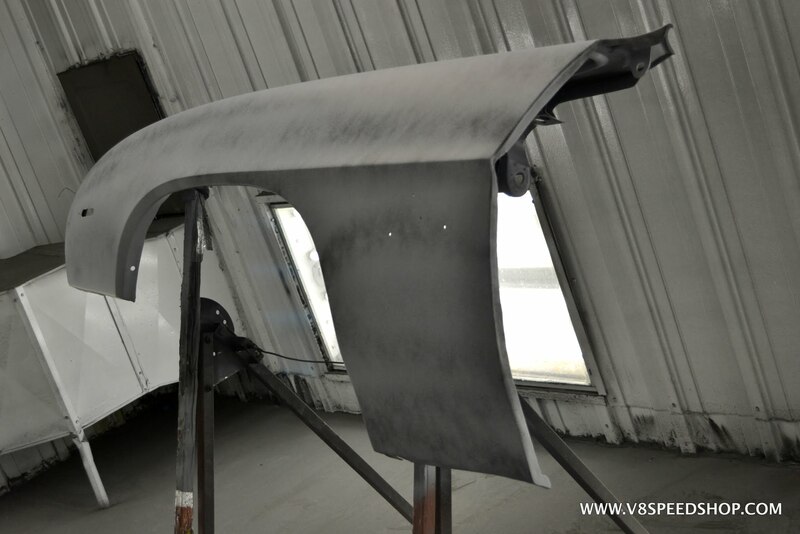 Guide coat is used throughout to ensure complete coverage. 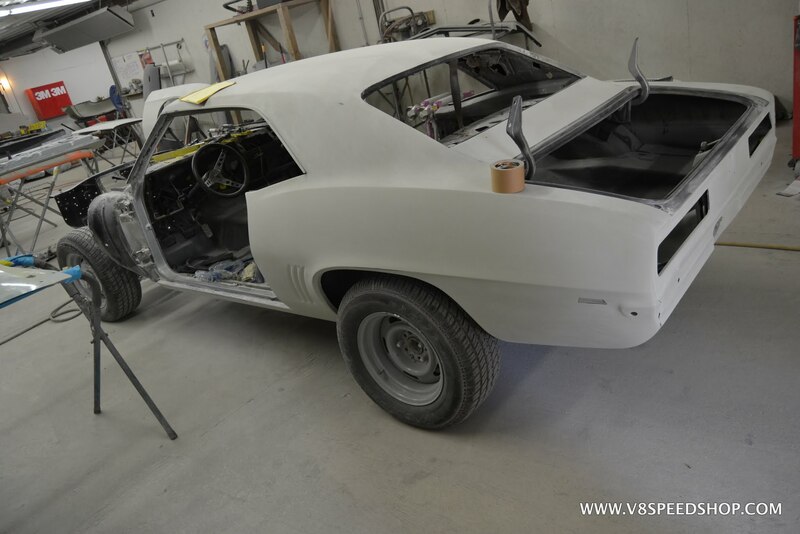 Details are sanded, trim is installed again to check fit, and soon the Camaro is ready to return to the paint booth for a coat of sprayable polyester primer. 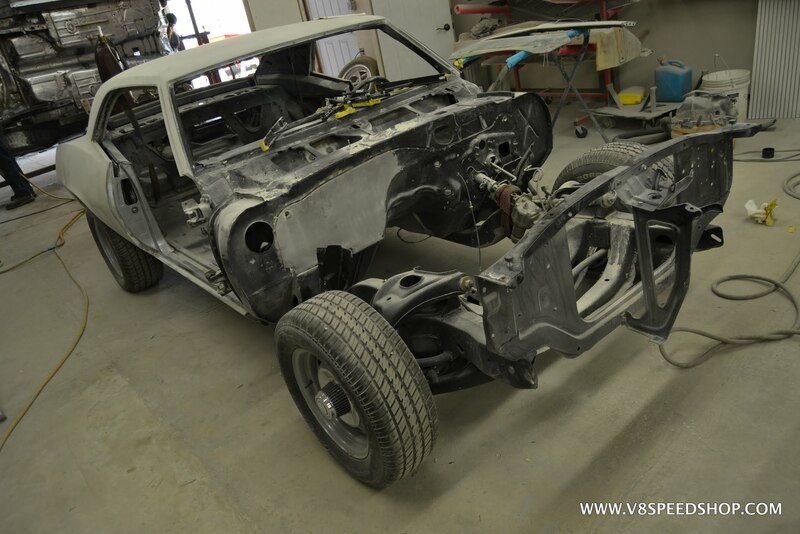 At this point, the whole car is in 180 grit and is cleaned and masked for the polyester sprayable filler. 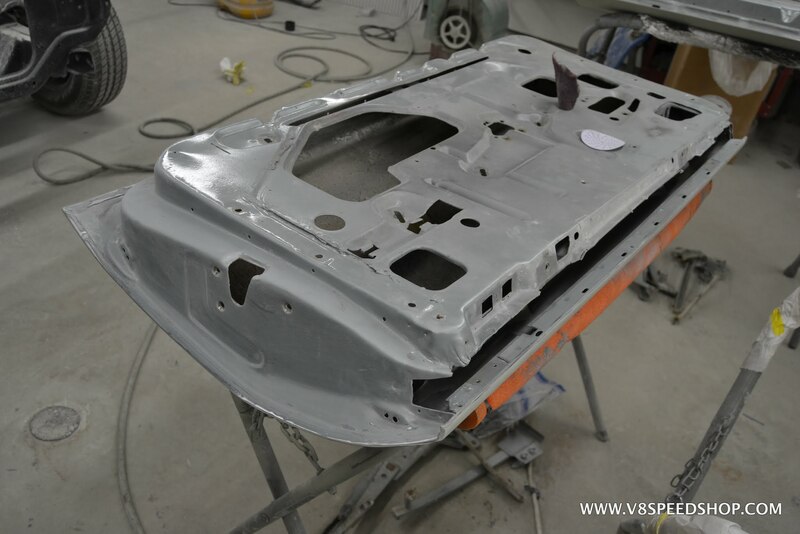 After the spray, the car returns to the body shop for more block sanding! 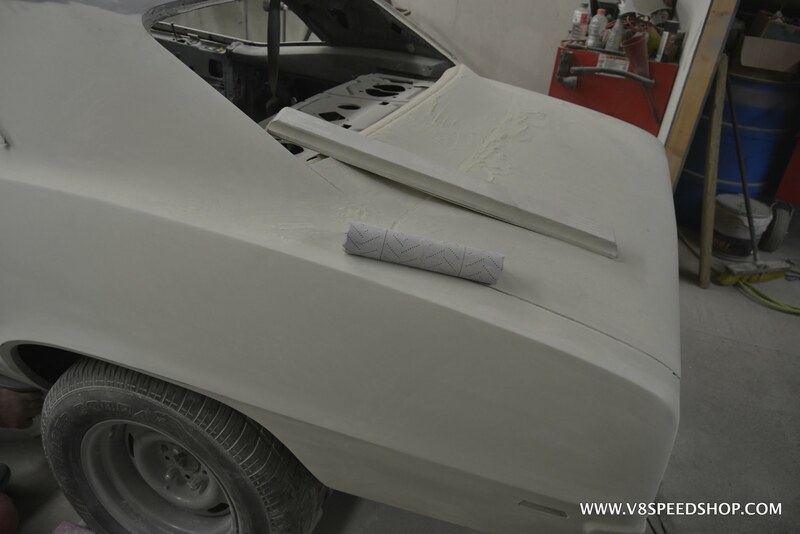 The Camaro’s body is block sanded until all the surfaces are smooth, straight, and ready for their next steps. 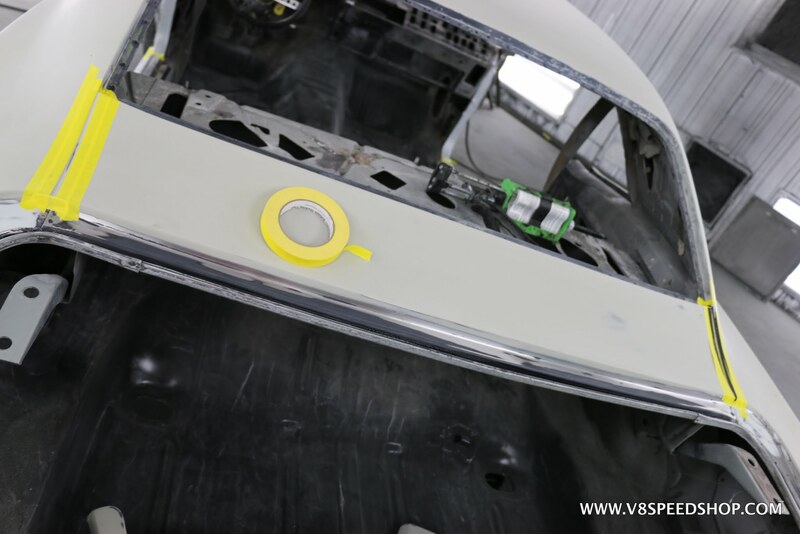 These include sanding the edges of panels, door and fender jambs, trunk jambs, and prepping the backsides of panels. 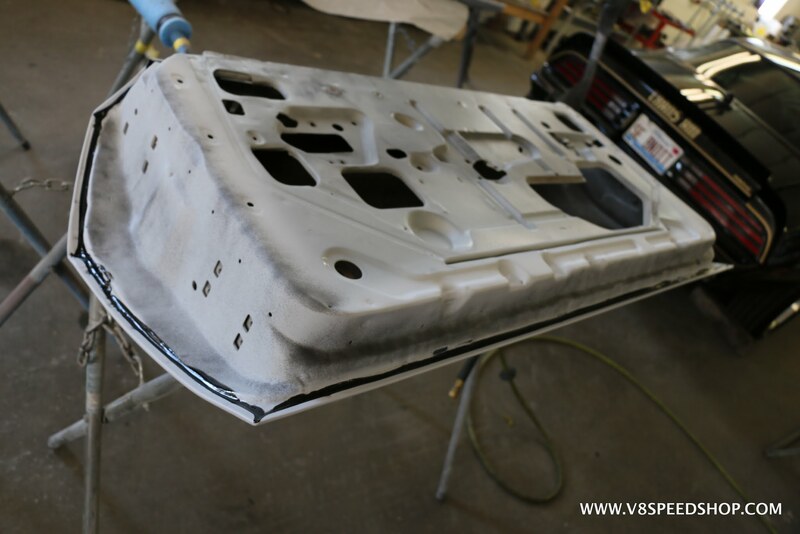 These steps are done with the car disassembled, so it came apart after the exterior block sanding. 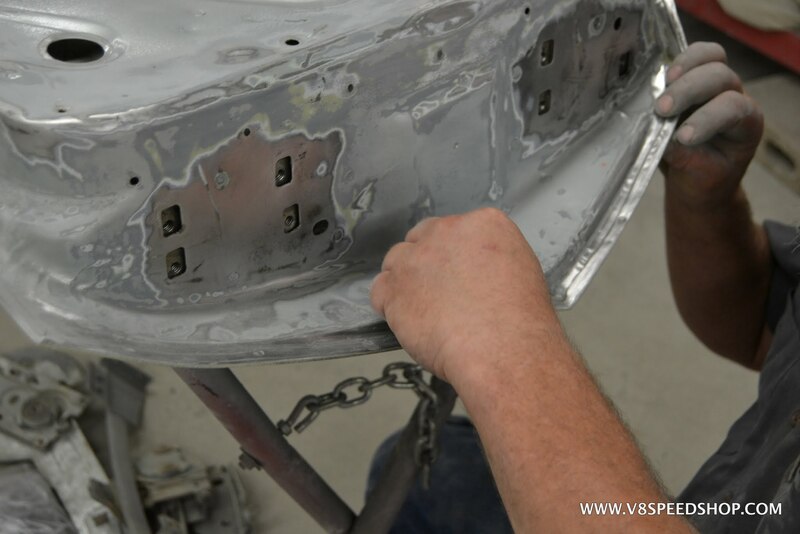 All the bolt-on panels were carefully disassembled from the Camaro’s body. 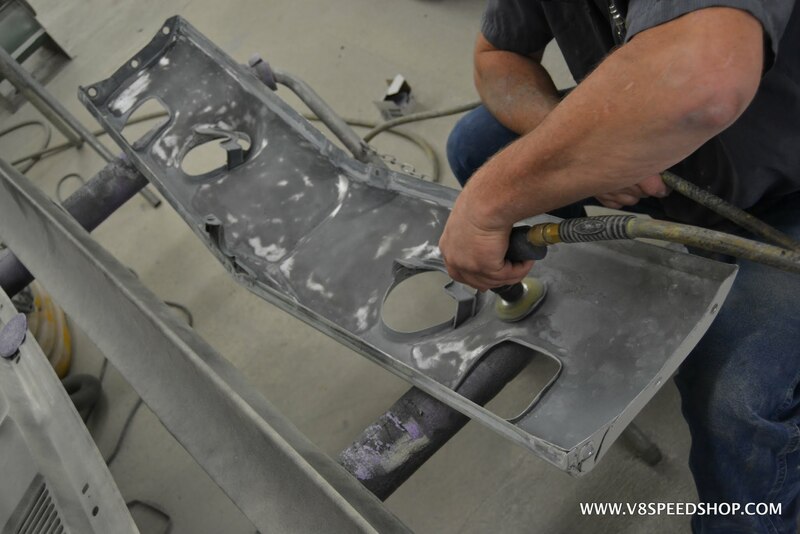 At this stage, our team takes time to sand detail areas on the body shell, like door jamb areas, tops of rocker panels, window edges, and other tight spots. Each panel is then given additional attention. 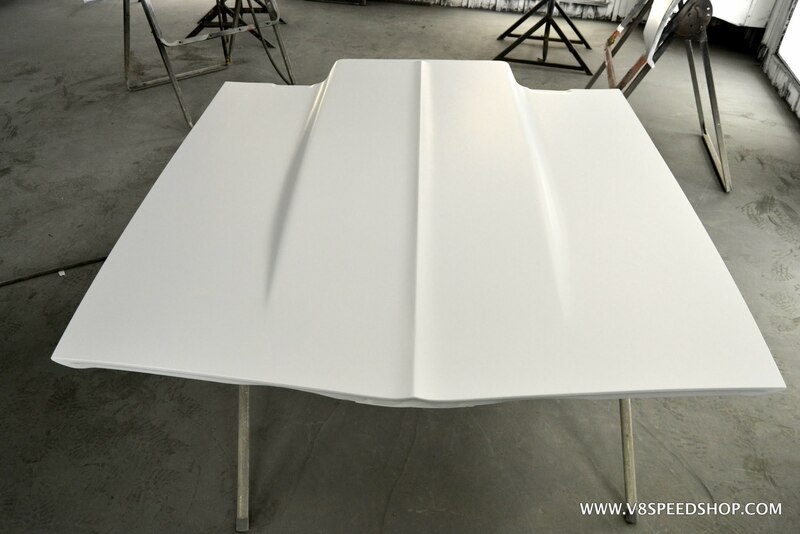 For example, the backsides of the fenders and all of the fender edges are dressed, as are the backs of the doors, header panel and lower valance, hood, deck lid, etc. These details might seem tedious and are truly time-consuming, but they help make the difference between a standard repayment, and a car that has high-quality paint on every surface. 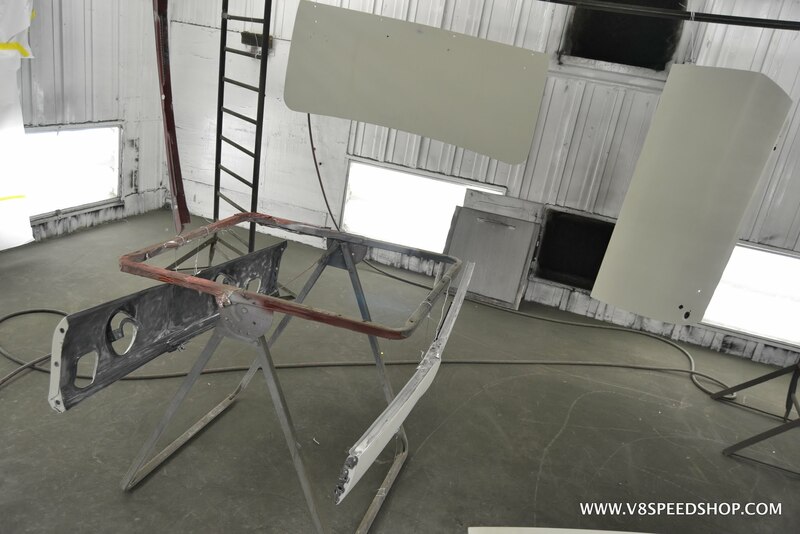 Once the polyester had been sanded and refined, the parts were all cleaned and brought back into the paint booth for a couple more coats of primer. After the primer, another guide coat was applied to aid in the next round of sanding. 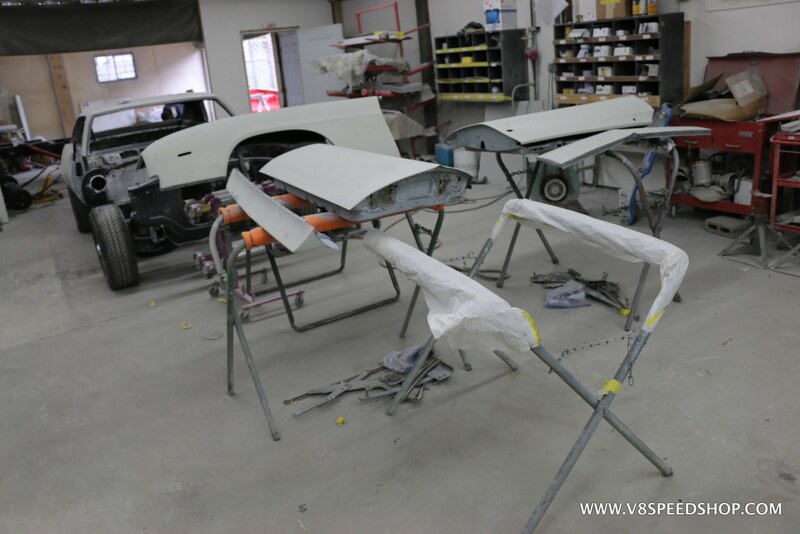 The body shell was also cleaned and prepped for application of 3M seam sealers before priming. 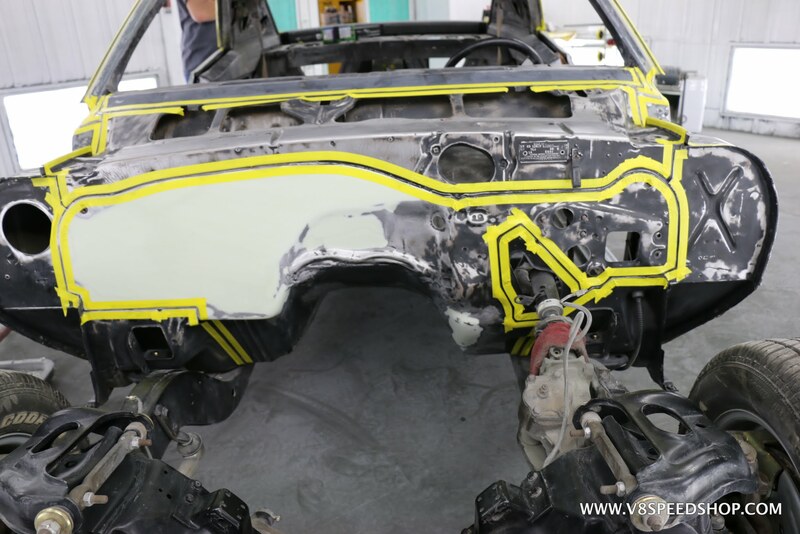 The path of the seam sealer was taped out so it would be a clean application. Seam sealer applied to door skin edges.